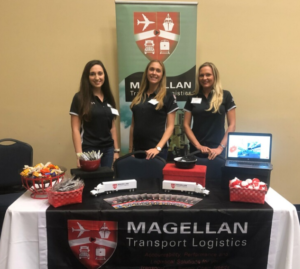 Recruiters from regional, national, and international transportation and logistics companies participate in the Transportation and Logistics Career Day in the fall and spring. T&L Career Day offers more than 170 one-on-one prescheduled interviews for internship, part-time and full-time positions along with the opportunity to visit the T&L Employer Expo in the afternoon. Interviews are open to T&L and Operations Management students and recent T&L graduates who are STAR Certified with a minimum GPA of 2.75 (cumulative or upper level). The T&L Expo requirement is STAR Certified with 2.5 GPA. AV Logistics, CEVA Logistics, C.H. Robinson, Central Oceans, Corporate Traffic, Crowley Maritime, Fanatics Retail Group, Florida East Coast Railway, Florida Rock & Tank Lines, Henry Schein, Home Depot, Interline Brands, JAXPORT, J.B. Hunt, Landstar, Magellan Transport Logistics, Ravago International, Shoreside Logistics, Stein Mart, the Suddath Companies, Total Military Management, Volkswagen, Werner Enterprises, Yusen Logistics, and many more.